This wall mounted, stainless steel pass through window is ideal for the transfer of parts or equipment in and out of a cleanroom with an elimination of contamination and a reduction of "traffic." 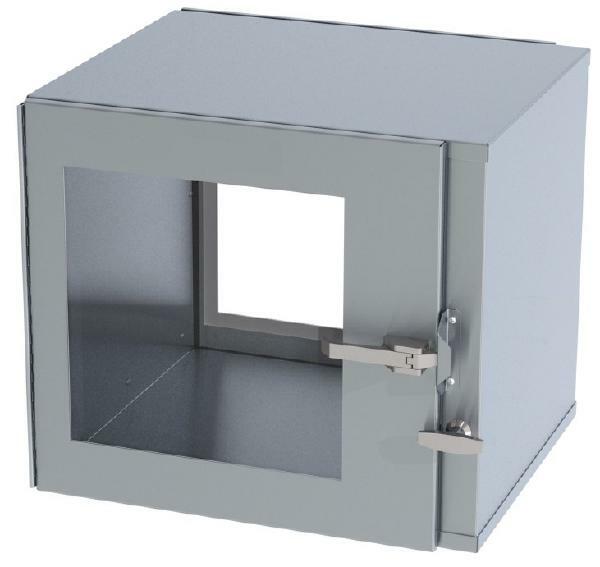 This pass through window is constructed with a welded type 304 stainless steel, making it strong, sturdy, and easily cleaned while providing a superior look to your cleanroom. The all metal construction free of particle board also provides the durability to resist the warping, cracking, or chipping characteristics of formica which could then lead to the growth of biological contamination. *** Includes Mechanical Interlocks with stainless steel T-Handles and stainless steel Trim Kits. The doors are made with a heavy duty stainless steel frame, stainless steel continuous hinge, safety glass viewing window, closed cell PVC door gasket, and a Type 316 stainless steel lever compression door latches. The stainless steel frame adds strength and prevents cracking of the safety glass, a common problem with frameless doors. Although this stainless steel version is our most common model, it is also offered with a built-in HEPA filter or with a light weight polypropylene construction. The poly version is only recommended when dealing with certain chemicals that are corrosive with stainless steel. Also available in custom sizes and configurations.